I received this book for free via NetGalley in exchange for an honest review. So, I just finished this book... and holy cow. 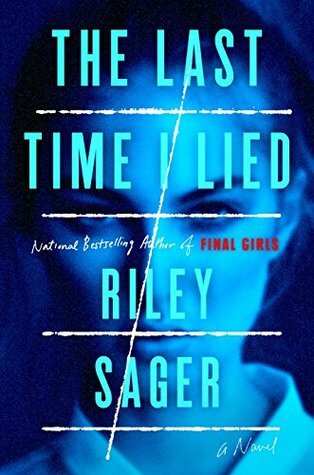 Between this one and Final Girls, Riley Sager is now one of my favorite authors. If his writing continues to impress me the way that these two have, that won't be changing any time soon. As soon as I realized that the author of Final Girls was releasing a new book, I knew that I HAD to have it. Not reading it wasn't an option and, after reading the synopsis for it, I couldn't wait to get my hands on it. The Last Time I Lied promises a story full of suspense and intrigue, mystery and thrill. It definitely delivers. I was sucked into the story from the very beginning and it never let up. This was definitely one of those books that kept my attention from cover to cover and, when I wasn't reading it, had me dying to get back to it. The story itself is simply addicting. The idea of a summer camp has been used in slasher and horror movies so many times for a reason. It just works. It's a setting that offers up the possibility of so many things going wrong but also holds the intensity of first time romance, summer sun, wet skin, and secret rendevouz. It's the perfect setting for a thriller involving teens and, as a past summer camp kid, it's easy for me to imagine how easily things could go from fun in the sun to nightmare material. The characters of The Last Time I Lied are brilliant. The personalities and actions of each person are so well developed and attuned to their specific role in the story that it insanely easy picture them as real people. They each have a darker side to them, a mental illness, secrets, mistakes, lies. Camp Nightingale and it's surrounding Lake Midnight are perfect characters all their own. Rich in folklore, secrets, a hidden past, and the mystery of not only the girls that have gone missing there, but also what lies beneath the water itself. I just couldn't get get enough of this mystery and if you're a fan stories like this, or just love a good thrill, I highly suggest you check it out.